The Bhagavad Gita is one of India’s best known scriptures. It tells the story of Arjuna, a warrior on the eve of battle who has lost heart and become uncertain as to his duty. Arjuna turns to his spiritual guide, Krishna, for answers to all the key questions of life, questions about wisdom and service and spirituality. The battle that Arjuna is about to fight is the perfect metaphor for life and the interior battle we all fight to live a life that is meaningful and fulfilling. The Gita, in essence, is a manual for how to live. 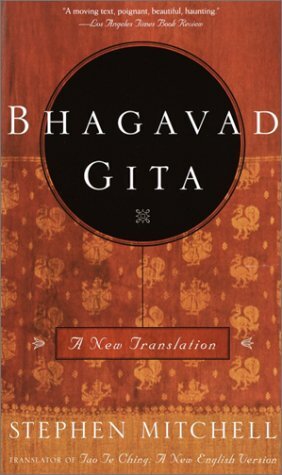 For my yoga teacher training, we were asked to read a translation of the Bhagavad Gita by Eknath Easwaran. On the back cover, Easwaran’s version is described as “reliable” and “readable”, and this is definitely true. Easwaran opens the book with an introduction to the Gita, setting the scene, and then each chapter of the Gita opens with a brief introduction that explicates the content of that chapter. This makes the story easy to follow, and really helps in understanding the context of Arjuna’s and Krishna’s conversation. The endmatter of the book includes a section of notes (typically, helpful insights on issues of translation), as well as a glossary of Sanskrit terms and an index. Easwaran’s version really focuses on making the Gita accessible for the reader, so this version is a great place to start if you’re reading the Gita for the first time. I had read the Bhagavad Gita previously, in Stephen Mitchell’s translation. Mitchell is known as a translator of ancient poetry – he’s done the epic of Gilgamesh and the Tao Te Ching, among others. The great thing about Mitchell’s work is that he finds a way to take this ancient poetry written in another language and capture not just the meaning but the beauty of the language. Easwaran’s translation of the Gita is verse, but Mitchell’s translation is poetry. The last time I read it, I was looking mostly at the poetry; I decided to read it again, and this time, it was really enjoyable to read the book in a different context, looking more at the content, the instructions for how to live. Definitely got more out of it this time. When we were assigned to read the Bhagavad Gita for class, I chose to read both versions back to back. I didn’t try to do a line-by-line comparison (that would defeat the purpose of reading it at all, really). Instead, I re-read the Mitchell translation, and then read the Easwaran translation, in the hope that reading both versions would deepen my understanding. I think it did, but I also felt a little burnt out by the time I got to the end of the Easwaran version. I definitely want to reread both versions again, but next time I’ll space them out more.